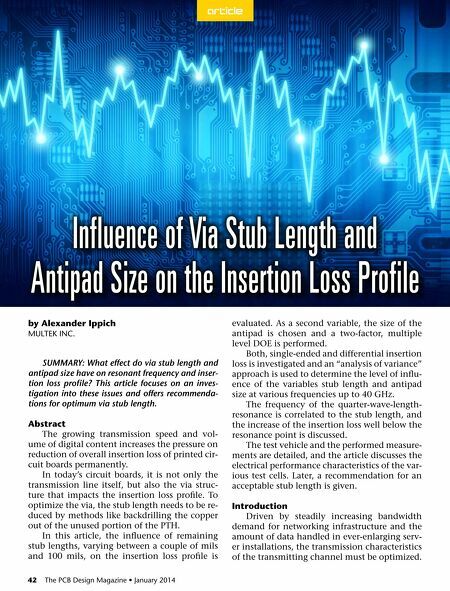 article Influence of Via Stub Length and Antipad Size on the Insertion Loss Profile by Alexander Ippich Multek Inc. SUMMARY: What effect do via stub length and antipad size have on resonant frequency and insertion loss profile? This article focuses on an investigation into these issues and offers recommendations for optimum via stub length. Abstract The growing transmission speed and volume of digital content increases the pressure on reduction of overall insertion loss of printed circuit boards permanently. In today's circuit boards, it is not only the transmission line itself, but also the via structure that impacts the insertion loss profile. To optimize the via, the stub length needs to be reduced by methods like backdrilling the copper out of the unused portion of the PTH. In this article, the influence of remaining stub lengths, varying between a couple of mils and 100 mils, on the insertion loss profile is 42 The PCB Design Magazine • January 2014 evaluated. As a second variable, the size of the antipad is chosen and a two-factor, multiple level DOE is performed. Both, single-ended and differential insertion loss is investigated and an "analysis of variance" approach is used to determine the level of influence of the variables stub length and antipad size at various frequencies up to 40 GHz. The frequency of the quarter-wave-lengthresonance is correlated to the stub length, and the increase of the insertion loss well below the resonance point is discussed. The test vehicle and the performed measurements are detailed, and the article discusses the electrical performance characteristics of the various test cells. Later, a recommendation for an acceptable stub length is given. Introduction Driven by steadily increasing bandwidth demand for networking infrastructure and the amount of data handled in ever-enlarging server installations, the transmission characteristics of the transmitting channel must be optimized.